Eric Schierhorn had the skills and the smarts to be a top-flight goaltender even before he came to the Muskegon Lumberjacks. But once he had the opportunity to learn from one of the greatest netminders of all time his game reached another level. And now the sky’s the limit for the Anchorage, Alaska native. During his two seasons in the United States Hockey League, Schierhorn grew up under the watchful eye of John Vanbiesbrouck, the U.S. Hockey Hall of Famer who serves as the general manager and director of hockey operations for the team. And during that time, the man they call Beezer has liked what he has seen from his young netminder. 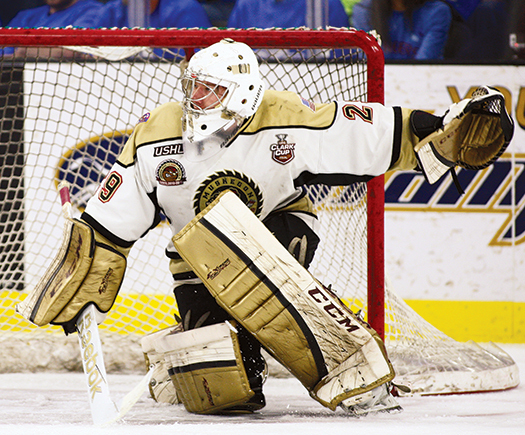 An athletic goaltender who patterns his game after San Jose Sharks netminder Alex Stalock, Schierhorn also takes a thinking-man’s approach to the position, which has helped set him apart from the other topnotch goaltenders in the USHL. Named the Dave Peterson Goaltender of the Year for 2015. A member of the 2014 U.S. Junior Select Team that won the Junior A Challenge. Played in the 2013 Under-18 Four Nations Cup. That approach allowed Schierhorn to grab hold of the No. 1 role with the Lumberjacks and never let go. In his 43 regular-season games, he finished with a 26-13-4 record to go with a 2.51 goals-against average and a .927 save percentage. Part of his success can be traced back to his play on the international arena. As a member of the U.S. Junior Select Team, Schierhorn helped bring home the title at the 2014 World Junior A Challenge in Kindersley, Saskatchewan. In addition to being named to the all-tournament team with a 0.97 goals-against average and .959 save percentage, he led the U.S. to a 3-2 overtime victory against Denmark. That shot of confidence carried over once he returned to Muskegon. That confidence was evident to those around him as that international success provided a spark as Schierhorn led the Lumberjacks to their first Clark Cup Final. “It allowed him to build an identity in the game, which is important. You put on the red, white and blue and let’s face the facts, you feel very good,” said Vanbiesbrouck, who represented the USA eight times in his career. As he prepares to hear his name called at the 2015 NHL Entry Draft, Schierhorn will look to refine his skills at the University of Minnesota, where he has a chance to lead the Gophers back to the top of the college hockey world. Kerner Berish can thank his mom’s busy schedule for helping him become a young entrepreneur with a bright future. When the Avon, Ohio youngster was stuck at a soap party following hockey practice, Kerner and his aunt Donna experimented with different combinations to help combat every hockey player’s all too common problem: smelly hockey equipment. “I was using it in the locker room and my friends liked how it smelled, so they wanted to know how they could get some,” he said. With help from his aunt’s California soap company, Chubb’s Stink Away was born (Chubb’s being his father’s nickname for him). Much to the delight of hockey moms at the North Olmsted Hockey Club, Kerner, with his signature bowtie, has sold hundreds of bottles while learning the value of a dollar and the art of the deal in the process. Kerner is using the money to help save for college, while also donating five percent of the proceeds to the North Olmsted Hockey Club Hardship Fund to help players who cannot afford club fees and equipment costs.